NES Karnov (USA) in 08:58.5 by adelikat. 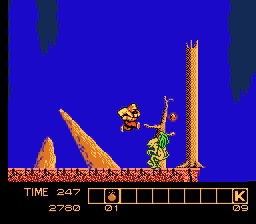 Karnov is one of those games whose fame defies my logic ― Bisqwit. The game retells the legend of a muscular fire-spitting man called Karnov, employed by Scottish villagers to eat gypsies' babies and pillage their settlements. Except in this particular case, Karnov's full name is Jinborov Karnovski, he looks like an old-school Ukrainian, turns blue when hit, and his goal here is to take some kind of treasures from feeble, unsuspecting enemies. Later in the game he also grows a pair of wings and flies. In doing so, he strongly defies laws of physics, common sense, and notions of subtle Kid Icarus mockery. The developers of this game, Data East, probably decided it would be a good idea to only let the screen scroll in one direction at once, and pretty slowly at that. It's not particularly surprising, though, considering the previous paragraph. This new version of Karnov TAS by adelikat is a ~5 second improvement over the previous movie by Arc. The time was saved thanks to taking damage in a different part of the run, as well as various small optimizations scattered around.